You’re lucky to live in west Surrey here if you love nature! The heathlands and commons in the area are acclaimed for their biodiversity and the rare species which inhabit them. The most important is Chobham Common: the largest National Nature Reserve in the south-east of England and one of the finest remaining examples of lowland heath in the world. It’s a Site of Special Scientific Interest (SSSI) and Thames Basin Heaths Special Protection Area (SPA). While we are encouraged to enjoy this special area, it needs protection. The ecosystem will be destroyed and wildlife will suffer if too many people use it, and they (or their dogs) wander from the paths into the heath. Rare birds such as the Dartford warbler and Nightjar are highly sensitive to visitors! Chobham Water Meadows provide an excellent alternative for a gentle stroll and to exercise animals. 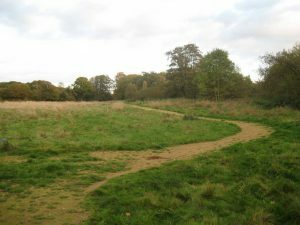 The 23.5 hectare site is designated as a Suitable Alternative Natural Greenspace (SANG): these areas are created as enhanced and attractive greenspaces that provide an enjoyable natural environment for recreational use, and so avoid disturbing birds and other wildlife on SPAs such as Chobham Common. As if that wasn’t enough acronyms, the eastern part of Chobham Water Meadows is classified as a Site of Importance for Nature Conservation (SINC)! This former agricultural land beside the Mill Bourne stream was purchased by Surrey Heath Borough Council in spring 2015. It has since undertaken work to improve drainage, tree safety and alleviate potential flooding. Work completed in the spring of 2017 made these meadows even more accessible. Some of the footpaths have been improved to provide a scenic and peaceful local greenspace with easy circular walks along public footpaths – even for visitors with wheelchairs. 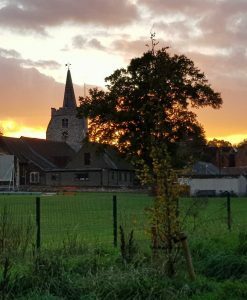 Visitors are welcome to exercise their dogs, to cycle, to run, or just to amble through this special place taking in the meadow vistas, woodland boundaries and the gentle Mill Bourne. There’s parking in the public car park is situated off Chobham High Street, behind the “Chobham Rider” store. An easy walk I remember doing when my legs worked properly is a 3.5 mile circular alongside the Mill Bourne stream eastwards to Emmets Mill (now a private house and near Fairoaks Airport), returning via a footpath to the west of Philpott’s Lane and then Sandpit Hall Road. It’s not a walk I could manage nowadays: despite being level it has several stiles. But if you’re reasonably able-bodied, there’s a leaflet to guide you at https://tinyurl.com/yd26ehqp. 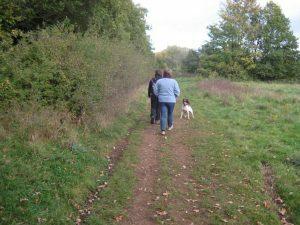 The same walk is on the iFootpath site at https://tinyurl.com/y7242tj8t.